State the aggregate market value of the voting and non-voting common equity held by non-affiliates computed by reference to the price at which the common equity was sold, or the average bid and asked price of such common equity as of the last business day of registrant’s most recently completed second fiscal quarter. As of June 30, 2009, the value was approximately $26,433,831. State the number of shares outstanding of each of the issuer’s classes of common equity: 19,304,921 as of March 17, 2010. 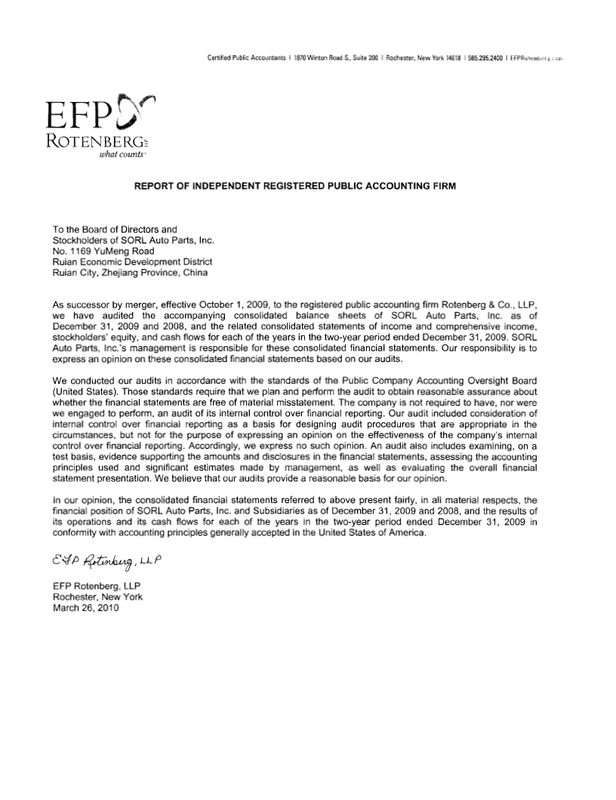 Portions of the registrant’s definitive proxy statement for its annual meeting of shareholders, scheduled for May 27, 2010, are incorporated by reference into Part III of this report. Through its 90% ownership of the Ruili Group Ruian Auto Parts Co., Ltd., a Sino-foreign joint venture (the “Joint Venture”), SORL Auto Parts, Inc. (together with our subsidiaries, “we,” “us,” “our” or the “Company”) develops, manufactures and distributes automotive air brake systems, air controlling systems and other related components to automotive original equipment manufacturers, or OEMs, and the related aftermarket both in China and internationally. Installed on the chassis, air brake systems include a collection of various air brake components using compressed air and functioning as the execution device for service braking and parking braking. The Company’s products are principally used in different types of commercial vehicles, such as trucks and buses. Air brake systems, air controlling systems and other related components are critical components that ensure driving safety. Our primary location is in Ruian City, Wenzhou, Zhejiang Province, People’s Republic of China. Wenzhou is a southeast coastal city and is a center of automotive parts manufacturing in China. The Company’s main products include spring brake chambers, clutch servos, air dryers, and main valves and manual valves, all of which are widely used in the brake systems for various types of commercial vehicles such as trucks and buses. Reliable functioning of those valves is critical to safety both when driving and parking. Through the Joint Venture, the Company manufactures and distributes commercial vehicle air brake systems, air controlling systems and other related components in China and internationally. Installed on the chassis, air brake valves include a collection of various air brake components using compressed air and functioning as the execution device for service braking and parking braking. Our products are principally used in different types of commercial vehicles, such as trucks and buses. Air brake systems and other related components are critical components that ensure driving safety. We produce an extensive range of products covering 40 categories and over 1000 specifications in air brake system, air controlling system and others, which are widely used in different types of commercial vehicles. Additionally, we offer a more complete product line including non-valve products, which are sourced from the Ruili Group. Such outsourced non-valve products include power steering pumps and other pumps, automobile electrical components and auto meters. We seek to introduce new products, maintain high quality, and provide excellent customer support. When working with a customer, our goal is to understand the design intent and brand image for each product and leverage our extensive experience and innovative technology to deliver products. The Company supports its products with a full-range of styling, design, testing and manufacturing capabilities, including just-in -time and in-sequence delivery. Sales from air brake systems, air controlling systems and other related components accounted for 70.7%, 15.6%, 13.7%, respectively, of our total sales in 2009. In 2008, these products accounted for 62.2%, 13.9% and 23.9% of sales, respectively. The Company obtained ISO9001/QS9000/VDA6.1 System Certifications in 2001. We passed the ISO/TS 16949 System Certification test conducted by the TUV CERT Certification Body of TUV Industrie Service GmbH in 2004, and its annual review in 2009. The ISO/TS 16949 System, a higher standard replacing the ISO9001/QS9000/VDA6.1 System, was enacted by the International Automotive Task Force and is recognized by major automobile manufacturers all over the world. The annual reviews for other certifications which we passed in 2009 included ISO14001 on environmental management and OHSAS18001 for health and safety management, reflecting the Company’s commitment to workplace safety, health and environmental protection. The automobile industry is one of China’s key industries, contributing significantly to the growth of China’s economy. Based on statistics published by the China Association of Automobile Manufactures, in 2009, China’s automobile output and sales volume both reached record high levels of 13.79 million and 13.64 million units, increasing by 48% and 46%, respectively, compared with 2008 figures. The output and sales volume of commercial vehicles increased 33% and 28% to 3.41 million units and 3.31 million units, respectively. We are the largest commercial vehicle air brake systems manufacturer in China. In general, our customers are divided into three groups: OEMs in China, aftermarket distributors in China, and international customers, accounting for approximately 50.5%, 25.2% and 24.3%, respectively, of the Company’s annual sales for 2009. OEM Market - We have established long-term business relationships with most of the major automobile manufacturers in China. We sell our products to 62 vehicle manufacturers, including all of the key truck manufacturers in China. In addition to heavy-duty trucks, our products are also widely used in air brake systems for buses. Typically, bus manufacturers purchase a chassis from truck chassis manufacturers which already have incorporated our air brake systems. The table below presents comparative information for 2009 and 2008 on the Company’s top 5 OEM customers. A few of our principal OEM customers are: Foton Motor Group, Dongfeng Motors Group and FAW Group Corporation, which were the top three commercial vehicle manufactures in China in 2009, according to the China Association of Automobile Manufactures. According to a news release from Foton Motor Group, Foton Motor Group was the largest commercial vehicle manufacture in the world in 2009. Baotou North-Benz Heavy Duty Truck Co., Ltd. and Anhui Hualing Automobile Co., Ltd., with rapid growth in the light-duty vehicle market in 2009, also are our customers. Aftermarket - The Company’s Chinese sales network consists of 28 authorized distributors covering the following 7 regions nationwide: Northeast Region, North Region, Northwest Region, Southwest Region, Central Region, East Region and South Region. The 28 authorized distributors sell only “SORL” products and in turn channel the products through over 850 sub-distributors. Focus on both overseas aftermarket and OEM customers at the same time. The Company is selling its products into 101 countries and regions, and has begun to supply products to OEMs in India. We established a new joint venture in Hong Kong in 2009, focus on expanding SORL’s international sales network in the Asia-Pacific region and creating a larger footprint in Europe, the Middle East and Africa with a target to create a truly global distribution network. We presently have four international sales centers. These are located in UAE, USA, Australia, and India. They carry out localization strategies to meet the different market demands and to strengthen service support. In 2009, export sales accounted for 24.3% of total revenue. Products are exported to more than 101 countries and regions in the world. Total export sales in 2009 decreased by 34.5% compared with 2008. We conduct our business in a complex and highly competitive industry. The global automotive parts industry principally involves the supply of systems, modules and components to vehicle manufacturers for the manufacture of new vehicles. Additionally, suppliers provide components to other suppliers for use in their product offerings and to the aftermarket for use as replacement or enhancement parts for older vehicles. In the current global automotive industry, vehicle manufacturers generally only engage in assembling but not manufacturing non-key automotive parts. Rather, they source these components through a global network of suppliers. As a result, only those automotive parts manufacturers with large-scale production, advanced technology and the ability of producing system modules, can supply their products to vehicle manufacturers directly. The automotive parts industry in China is fragmented and there are many small manufacturers which mainly target the aftermarket. However, there are not many companies who have established both nationwide aftermarket sales networks and close relationships with leading OEM manufacturers. As the largest commercial vehicle air brake system manufacturer in China, we have established long-term business relationships with most of the major automotive manufacturers in China, such as FAW Group (a.k.a. First Auto Group), Dongfeng Motors Group, Beiqi Foton Motor Co., Ltd., Baotou North-Benz Heavy Duty Truck Co., Ltd. and Anhui Jianghuai Automobile Co., Ltd. Management believes that the key success factors in the commercial vehicle air brake systems are product quality, price competitiveness, technical expertise and development capability, new product innovation, and reliability and timeliness of delivery, which may be enhanced by recruiting highly qualified managers and other employees, developing improved product design capability and facilities, and maintaining better customer service. Technology: We view technological innovation and leadership as the critical means to enhance our core competence. Our technology center includes a laboratory specializing in the research of automotive brake controlling technologies and development of air brake system products. We upgraded our test equipment in 2009, which improved system test capability. Product Development: Because management believes that our products ultimately define our success, we continue to increase our budget for research and development activities. Through our international sales offices in the US, Australia, the Middle East and India, we are able to promptly collect information about current trends in automotive technologies, which in turn is applied to our new product development and used to enhance our ability to provide domestic OEMs with advanced products. In addition, IT application and strict implementation of ISO/TS16949 standards in the development process greatly shorten the development lead time and improve new product quality. China Sales Networks: We have 28 authorized distributors covering 7 regions in China. We help train their sales force and improve their service quality. These authorized distributors in turn channel “SORL” products through over 850 sub-distributors throughout China. Production Management: During 2009, we implemented an Enterprise Resource Planning system, which is an integrated computer-based system used to consolidate all business operations into a uniform and enterprise wide system environment. We follow Six Sigma management practices, which is a customer centered, systematic, data driven way of doing work more efficiently. Also we have improved our manufacturing process to better assure the stability and consistency of product quality and improved material utilization and decreased manufacturing cost. We strengthened our sales and marketing efforts in 2009. The sales headcount for domestic (PRC) sales and international sales was 37 and 38, respectively. Products are sold under the “SORL” trademark, which we license on a royalty free basis from the Ruili Group. The license expires in 2012. In China, the commercial vehicle air brake systems market can be divided into 2 segments: OEM market and aftermarket. OEM Market –In 2009, we strengthened our long-term relationships with major domestic OEM customers, and expanded into the municipal bus market and agricultural vehicle market. Currently, we have 62 OEM customers. Normally, these customers sign one-year sales contracts, which are revised as needed. We have successfully expanded our production capacity so that we were able to increase our sales to the OEM market by $14.1 million or 28.8% for the year ended December 31, 2009, as compared with the year ended December 31, 2008. Domestic Aftermarket - We place great emphasis on the Chinese automotive aftermarket business and sell products in the aftermarket for replacement purposes. With the rapid growth of commercial vehicles output in recent years and the increasing number of vehicles on the road, there has been an increasing demand for replacement parts in the aftermarket. We have an aftermarket sales network including 28 authorized distributors covering 7 regions nationwide in PRC. These distributors sell only products under the “SORL” trademark to over 850 Chinese distributors. We provide product technical services to these distributors, and also conduct periodic performance evaluations, and reserve the right to terminate the distributorship of those with frequent delinquencies or poor sales records. For 2009, the Company achieved total revenue of $31.5 million in domestic aftermarket sales, a decrease of 11.3% from 2008. Focus on both overseas aftermarket and OEM customers at the same time. The company is selling its products into 101 countries and regions, and has begun to supply our products to local OEMs in India. Company also actively participate in international trade shows including more than ten international exhibition as Automechanika in Frankfort Equip Auto in Pairs, Automotive Aftermarket Products Expo in Las Vegas, Automechanika Middle East in Dubai and China Import and Export Fair in Guangzhou, to acquire new customers and new orders. In 2009, we established a new joint venture in Hong Kong focused on focused on expanding SORL’s international sales network in the Asia-Pacific region and creating a larger footprint in Europe, the Middle East and Africa with a target to create a truly global distribution network. We presently have four sales centers, located in UAE, USA, Australia, and India. They carry out localization strategy to meet different market demands and to strengthen service support. As of December 31, 2009, we had 143 technical staff members, consisting of 57 holding Engineer or Senior Engineer qualifications. Our technical staff includes 4 information technology specialists, 96 for new product development and design techniques, 10 for measurement and testing, 8 for MIS, and the other 25 persons are quality management engineers. Capitalizing on these resources, we have successfully developed innovative products and technologies such as a new type of clutch servo with sensor; a combined air dryer with build-in temperature-control device and unloader; and an inner-breath spring chamber which enables internal air circulation. We continue to invest in R&D efforts and to pursue patent protection. Currently we own23 patents and have filed applications for 26 other patents in China and an additional two in the U.S.
Our principal trademark is “SORL” which we license on a non-exclusive royalty free basis from the Ruili Group. The license currently expires in 2012 and we have an agreement with the Ruili Group that the license will be extended if the trademark registration for the trade name is extended. The Ruili Group has obtained a registration for “SORL” from the World Intellectual Property Organization and, in 2007, registered the trademark in US. We own the largest commercial vehicle air brake systems manufacturing base in China. We are seeking to expand our production capacity. We have re-deployed and streamlined our production / assembly lines, enabling us to rapidly expand our production capacity to meet increasing market demands for our products. The production process includes fixture, jig and die making, aluminum alloy die casting, metal sheet stamping, numerical control cutting, welding, numerical control processing, surface treatment, filming, rubber/plastic processing, final assembly and packaging. We have state-of-the-art manufacturing and testing facilities sourced from the US, Korea, Taiwan and mainland China, including computerized numerical control processing centers, computerized numerical control lathes, casting, stamping and cutting machines, automatic spraying and electroplating lines, cleaning machines, automatic assembly lines and three-dimensional coordinate measuring machines and projectors. In September 2007, the Joint Venture purchased land rights, a manufacturing plant and office building with a total floor area of 712,333 square feet, from Ruili Group Co., Ltd. The Joint Venture previously leased part of the facility from Ruili and occupied approximately 50% of it. As a result of this transaction, our production space is expected to meet our growth demand for the near future. All of the materials used are generally readily available from numerous sources. We have not, in recent years, experienced any significant shortages of manufactured components or raw materials and normally do not carry inventories of these items in excess of what is reasonably required to meet our production and shipping schedules. Critical raw materials are generally sourced from at least two or more vendors to assure adequate supply and price competition. We maintain relationships with over twenty material suppliers. In 2009, the three largest suppliers were Shanghai Jinshi Materials Co., Ltd., Shanghai Dechen Commodity Co., Ltd., and Shanghai Guihao Shiye Co., Ltd. which together accounted for 29.3% of the aggregate of raw materials we purchased. Among these companies, only Shanghai Jinshi Materials Co., Ltd., which accounted for 18.5%, was the source of more than 10% of total raw material purchases. Management believes that the most important factor to understand the Chinese automobile industry is the country’s rapid economic growth. According to China’s Statistics Bureau, China’s GDP growth rate for 2007, 2008 and 2009 was 11.4%, 9.0% and 8.7% respectively. The government of China has stated its intention to purse continued economic growth and development. The Company currently employs 2,419 employees, all of whom are employed full time: 58 for quality control, 143 technical staff, 75 sales and marketing staff, 2,101 production workers and 42 administrative staff. There are employment agreements with all of the employees whereby administrative staff workers agree to three years of employment and hourly workers agree to three years. Employment contracts with all employees comply with relevant laws and regulations of China. Certain persons serving as our officers and directors have existing responsibilities and, in the future, may have additional responsibilities, to provide management and services to other entities in addition to us. In particular, Mr. Xiao Ping Zhang, our Chief Executive Officer is an officer and a principal stockholder of Ruili Group Co. Ltd. which is engaged in the development, production and sale of various kinds of automotive parts as well as operating a hotel property and investing in the development of real property in China. The management of our joint venture is shared with the Ruili Group and therefore there may exist conflicts of interest between us and the Ruili Group in connection with its operation. Our joint venture agreement provides that the Board of Directors of the Joint Venture is comprised of three persons, two of whom are appointed by us. However, at the present time our Chief Executive Officer, Mr., Xiao Ping Zhang, is the founder of and employed at the Ruili Group. There can be no assurance that in the event of a conflict between us and the Ruili Group, our interests in the Joint Venture will not be adversely affected, or that our Company’s interests will always be fairly represented. The Ruili Group also provides certain services to the Company in the form of bank guaranties and licensing of certain technology. The Ruili Group also sells to us certain non-valve products which allow us to fill out our product lines which in 2009 represented approximately 13.6% of our sales. As a result, conflicts of interest between us and the other activities of those persons may occur from time to time. Our officers and directors are accountable to us and our shareholders as fiduciaries, which requires that such officers and directors exercise good faith and integrity in handling our affairs. However, the existing responsibilities limit the amount of time such officers and directors can spend on our affairs. Our operations depend highly on Messrs. Xiao Ping Zhang, our Chief Executive Officer, and Bao Jian Tao, our Chief Operating Officer, and a small number of other executives and the loss of any such executive could adversely affect our ability to conduct our business. Although no customer individually accounted for more than 10% of our revenues for the fiscal year ended December 31, 2009, our three largest customers accounted for approximately 19.2% of our revenues in each of 2009 and 2008. Dependence on a few customers could make it difficult to negotiate attractive prices for our products and could expose us to the risk of substantial losses if a single major customer stops purchasing our products. The success of our business depends in substantial measure on the legal protection of proprietary rights in technology we hold. We hold 22 patents in China and one in the United States, and have filed applications for 26 others in China and an additional two in the United States. We claim proprietary rights in various unpatented technologies, know-how, trade secrets and trademarks relating to products and manufacturing processes. We protect our proprietary rights in our products and operations through contractual obligations, including nondisclosure agreements. If these contractual measures fail to protect our proprietary rights, any advantage those proprietary rights provide us would be negated. Monitoring infringement of intellectual property rights is difficult, and we cannot be certain that the steps we have taken will prevent unauthorized use of our intellectual property and know-how, particularly in China and other countries in which the laws may not protect our proprietary rights as fully as the laws of the United States. Accordingly, other parties, including competitors, may improperly duplicate our products using our proprietary technologies. Pursuing legal remedies against persons infringing our patents or otherwise improperly using our proprietary information is a costly and time consuming process that would divert management’s attention and other resources from the conduct of our other business, and could cause delays and other problems with the marketing and sales of our products, as well as delays in deliveries. In 2009, approximately 49.5% of our sales were to the aftermarket. The average useful life of original equipment parts has been steadily increasing in recent years due to improved quality and innovations in products and technologies. The longer product lives allow vehicle owners to replace parts of their vehicles less often. Additional increases in the average useful life of automotive parts are likely to adversely affect the demand for our aftermarket products. A large portion of our common stock is held by a small number of stockholders. Mr. Xiao Ping Zhang, our Company’s Chief Executive Officer, and his brother, Xiao Feng Zhang, a member of our Board of directors, hold approximately 49.7% and 6.2% as of December 31, 2009, respectively, of the Company’s common stock. As a result, these stockholders are able to control the outcome of stockholder votes on various matters, including the election of directors and other corporate transactions including business combinations. The US Public Company Accounting Reform and Investor Protection Act of 2002, better known as Sarbanes-Oxley, was the most sweeping legislation to affect US publicly traded companies in 70 years. Sarbanes-Oxley created a set of complex and burdensome regulations. Compliance with such regulations imposes substantial burdens in terms of financial expense and commitment of personnel. There can be no assurance that we will have the personnel, financial resources or expertise to continue to meet requirements of these regulations. At March 17, 2010, we had approximately 518 registered stockholders of record of our common stock. This number does not include shares beneficially owned by investors through brokerage clearing houses, depositories or otherwise held in “street name”. The following discussion and analysis should be read in conjunction with our consolidated financial statements and the related notes thereto and other financial information contained elsewhere in this Form 10K. Fairford was organized in Hong Kong as a limited liability company on November 3, 2003. Fairford owns 90% of the equity interest of Ruili Group Ruian Auto Parts Co., Ltd., a Sino-foreign joint venture (the “Joint Venture”) established pursuant to the laws of the People’s Republic of China (“PRC” or “China”). The Joint Venture is a joint venture between our wholly-owned subsidiary, Fairford, and Ruili Group Co., Ltd. (the “Ruili Group”). In connection with its formation, effective January 19, 2004 the Joint Venture acquired the business of the Ruili Group relating to the manufacture and sale of various kinds of valves for automotive brake systems and related operations (the “Transferred Business”). This was accomplished by the transfer from the Ruili Group to Fairford of the relevant assets and liabilities of the Transferred Business including trade receivables, inventories and machinery, and the assumption of short and long term borrowings, at a consideration of approximately $6.39million. Pursuant to the formation of the Joint Venture, on January 17, 2004, the Ruili Group and Fairford signed a binding Joint Venture agreement (the “JV Agreement”). Pursuant to the JV Agreement, the Board of Directors consists of three directors; Fairford has the right to designate two members of the board and the Ruili Group has the right to designate one member. The majority of the Board has decision making authority with respect to operating matters. As a result, Fairford maintains operating control over the Joint Venture. As a result of the foregoing, through Fairford’s 90% interest in the Joint Venture, the Company manufactures and distributes automotive air brake systems, air controlling systems and other related components in China and internationally for use primarily in different types of vehicles, such as trucks and buses. There are forty categories of valves with over one thousand different specifications in air brake systems, air controlling systems and others. Management believes that it is the largest manufacturer of automotive air brake systems for commercial vehicles in China. Our discussion and analysis of our financial condition and results of operations are based upon our consolidated financial statements, which have been prepared in accordance with U.S. generally accepted accounting principles. The preparation of financial statements in conformity with those accounting principles requires us to make judgments and estimates that affect the amounts reported in the consolidated financial statements and accompanying notes. Those judgments and estimates have a significant effect on the consolidated financial statements because they result primarily from the need to make estimates about the effects of matters that are inherently uncertain. Actual results could differ from those estimates. We periodically re-evaluate our judgments and estimates that are based upon historical experience and on various other assumptions that we believe to be reasonable under the circumstances. Under a Tax Holiday in PRC, the Company is granted an exemption from income taxes for two years commencing from the first cumulative profit-making year and a 50% reduction in the income tax rates for the following three years. Fiscal year ended December 31, 2004 was the first cumulative profit-making year. As a result of the Joint Venture obtaining its Sino-foreign joint venture status in 2004, in accordance with applicable PRC tax regulations, the Joint Venture was exempted from PRC income tax in both fiscal 2004 and 2005. Thereafter, the Joint Venture is entitled to a tax concession of 50% of the applicable income tax rate of 26.4% for the two years ended December 31, 2006 and 2007. With the new PRC Enterprise Income Tax Law, effective on 1st January 2008, the China’s enterprises are generally subject to a PRC income tax rate of 25% and the Joint Venture is entitled to a tax concession of 50% of the applicable income tax rate of 25% for the year ended December 31, 2008. Additionally, the Company increased its investment in the Joint Venture as a result of its financing in December, 2006. In accordance with the Income Tax Law of the People's Republic of China on Foreign-invested Enterprises and Foreign Enterprises, the Joint Venture is eligible for additional preferential tax treatment. For the years 2007 and 2008, the Joint Venture entitled to an income tax exemption on all pre-tax income generated by the company above its pre-tax income generated in the fiscal year 2006. Thereafter, the Joint Venture will enjoy a 50% exemption from the applicable income tax rate of 25% on any pre-tax income above its 2006 pre-tax income, to be recognized in the years 2009, 2010 and 2011. The above taxation exemption was superceded, because the Joint Venture has been awarded the Chinese government's "High-Tech Enterprise" designation. The High-Tech Enterprise certificate is valid for three years and provides for a reduced tax rate of 15% for years 2009 through 2011. So, the effective income tax rate will be 15% for years 2009 through 2011. Sales consisted of air brake systems and related components manufactured by SORL and sold to Chinese domestic OEM and Chinese aftermarket customers and international customers; as well as distribution of non-valve auto parts sourced from related parties. With the approaching of implementation of the China III emission standard beginning July 1, 2008, the consumption of trucks equipped with China II engines was significantly spurred before the policy was enforced. This increased the output and sales volume of vehicles made in China in the first half of 2008. As a result, our Chinese OEM sales achieved a strong growth in the first half year of 2008. With the worsening financial crisis, our OEM sales sharply decreased in the second half year of 2008. Global financial conditions, involving a worldwide macroeconomic decline and weak global auto market, caused the demand for our products to decline during the first half of 2009. However, the Chinese’s government’s 4 trillion RMB stimulus package, which positively affected the development of China’s automobile industry, materially benefited our results in the second half of 2009. Further, we promoted our integrated system and modular supplies of air brake systems to our OEM customers and we increasingly focused on the light duty, bus and agricultural vehicle market in 2009. As a result of these positive factors, our sales to the Chinese OEM market increased by $14.1 million or 28.8% for the fiscal year ended December 31, 2009, as compared with the fiscal year ended December 31, 2008. During the year ended December 31, 2009, we generated revenues of $31.5 million from Chinese domestic aftermarket sales, a decrease of $4.0 million, or 11.3% from the year ended December 31, 2008. Accelerated replacement of medium-duty and heavy-duty trucks, and rising new vehicle usage in recent years resulted in the decreased sales in aftermarket in the short term. The global financial crisis has negatively affected our international customers, and caused local currencies to depreciate against the US dollar, while the lack of confidence in the growth of the world macro-economy has made our customers decrease their inventories in order to lower their risk. Consequently, our export sales decreased by $16.0 million or approximately 34.5% for the fiscal year ended December 31, 2009, from $46.4 million for 2008. Cost of sales for the fiscal year ended December 31, 2009 decreased to $89.5 million from $97.2 million for the fiscal year ended December 31, 2008, a $7.7 million or 7.9 % decrease, consistent with the decrease in revenues. Gross profit for the fiscal year ended December 31, 2009, increased by approximately $1.8 million or 5.3% to $35.5 million from $33.7 million for the fiscal year ended December 31, 2008. Gross margin increased by approximately 2.7 percentage points, from 25.7% in 2008 to 28.4% in 2009. We believe that the improvements in gross profits and gross margin reflect our focus in 2009 on increasing production efficiency, improving the technologies of products, and improving our product portfolio. We believe that our continued expansion to higher-profit new products will also help us to maintain or increase our gross profit margins. Selling expenses were $8,137,377 for the fiscal year ended December 31, 2009, as compared to $8,423,124 for the fiscal year ended December 31, 2008, a decrease of $285,747 or 3.4%. The decrease was mainly due to the decreased transportation expense as a result of decreased international sales. As a percentage of sales revenue, selling expenses increased to 6.5% for the fiscal year ended December 31, 2009, as compared to 6.4% for the same period in 2008. General and administrative expenses were $7,282,110 for the fiscal year ended December 31, 2009, as compared to $6,075,404 for the fiscal year ended December 31, 2008, an increase of $1,206,706 or 19.9%. As a percentage of sales revenue, general and administrative expenses increased to 5.8% for the fiscal year ended December 31, 2009, as compared to 4.6% for the same period in 2008. The increase was mainly due to increased staff salary and welfare costs, rent expenses, travel expenses and business entertainment expenses, which together increased by $987,777 as compared with the total for these items during the fiscal year ended December 31, 2008. Research and development expense was $4,335,464 for the fiscal year ended December 31, 2009, as compared with $3,219,895 for the fiscal year ended December 31, 2008, an increase of $1,115,569. The Company will continue to invest in new product development, particularly in upgrading traditional valve products and in developing electronically controlled products. Depreciation and amortization expense increased to $3.0 million for the fiscal year ended December 31, 2009, compared with depreciation and amortization expense of $2.71 million for the fiscal year ended December 31, 2008. Financial expense mainly consists of foreign exchange loss. Financial expense for the fiscal year ended December 31, 2009 decreased by $721,560 to $131,080 from $852,640 for the fiscal year ended December 31, 2008, which was mainly due to the lesser exchange loss incurred as compared to the fiscal year ended December 31, 2008. For the fiscal year ended December 31, 2009, other income included subsidy income of $190,167 compared with $307,520 for the fiscal year ended December 31, 2008. Through local governments, these subsidies were provided to the Company as economic incentives to secure business commitments and no repayment is required. The Joint Venture is registered in the PRC, and is therefore subject to state and local income taxes within the PRC at the applicable tax rate on taxable income as reported in the PRC statutory financial statements in accordance with relevant income tax laws. According to applicable tax laws regarding Sino-Foreign Joint Ventures, the Joint Venture was exempt from income taxes in the PRC for each of the fiscal years ended December 31, 2005 and 2004. Thereafter, the Joint Venture was entitled to a 50% income tax deduction for each of the three years ended December 31, 2008. Thus, the Joint Venture was exempted from PRC income tax in both fiscal 2004 and 2005, and entitled to a tax concession of 50% of the applicable income tax rate of 26.4% for the two years ended December 31, 2006 and 2007. With the new PRC Enterprise Income Tax Law, effective on 1st January 2008, China’s enterprises are generally subject to a PRC income tax rate of 25% and the Joint Venture was entitled to a tax concession of 50% of the applicable income tax rate of 25% for the year ended December 31, 2008. The Company increased its investment in the Joint Venture as a result of its financing in December, 2006. In accordance with the Income Tax Law of the People's Republic of China on Foreign-invested Enterprises and Foreign Enterprises, the Joint Venture was eligible for additional preferential tax treatment for the years 2007 and 2008. In those years, the Joint Venture was entitled to an income tax exemption on all pre-tax income generated by the Company above its pre-tax income generated in the fiscal year 2006. In 2009, 2010 and 2011, the Joint Venture will enjoy a 50% exemption from the applicable income tax rate of 25% on any pre-tax income above its 2006 pre-tax income. The above taxation exemption was superceded, because the Joint Venture has been awarded the Chinese government's "High-Tech Enterprise" designation. The High-Tech Enterprise certificate is valid for three years and provides for a reduced tax rate of 15% for years 2009 through 2011. So, the effective income tax rate will be 15% for years 2009 through 2011. In addition, the Joint Venture was entitled to a PRC tax credit equal to 40% of the additional investment in the Joint Venture used to purchase eligible domestic equipment, subject to certain limitations. During the fiscal year ended December 31, 2009 and December 31, 2008, the Joint Venture received an abovementioned income tax benefit of $694,746 and $377,147 respectively, which has been reflected as a reduction to current income tax expense. As a result of the factors discussed above, income tax expense was $1,796,622 for the fiscal year ended December 31, 2009 compared with $1,586,503 for the fiscal year ended December 31, 2008, an increase of $210,119. On March 1, 2006, the Board of Directors approved a total of 60,000 options to be issued to the four independent members of the Board of Directors. The contractual term of the options is three years. Total deferred stock-based compensation expenses related to stock options amounted to $178,904. This amount is amortized over the three year vesting period in a manner consistent with FASB ASC 505-50. The amortization of deferred stock-based compensation for these equity arrangements were $9,935 and $59,636 for the fiscal years ended December 31, 2009 and 2008, respectively. As of December 31, 2009, the 60,000 options had expired unexercised. On November 9, 2009, Maxim Group LLC transferred 35,000 warrants to OTA LLC and 35,000 warrants to Maxim Partners, LLC respectively. OTA LLC exercised the warrants on a cashless basis on November 12, 2009 and received 6,609 shares of common stock, based on a formula provided for in the initial grant. Maxim Partners, LLC and Chardan Capital Markets, LLC transferred 35,000 warrants and 30,000 warrants to OTA LLC on December 15, 2009 and December 11, 2009, respectively. OTA LLC exercised the warrants on a cashless basis on December 18, 2009 and received 18,598 shares of common stock, based on a formula provided for in the initial grant. There were no options or warrants outstanding as of December 31, 2009. Non-controlling interest in subsidiaries represents a 10% non-controlling interest in the Chinese located Joint Venture and 40% non-controlling interest in the Hong Kong located Joint Venture. Net income attributable to non-controlling interest in subsidiaries amounted to $1,376,791 and $1,381,230 for the fiscal year ended December 31, 2009 and 2008, respectively. The net income attributable to stockholders for the fiscal year ended December 31, 2009 increased by $385,206, to $12,756,066 from $12,370,860 for the fiscal year ended December 31, 2008 due to the factors discussed above. Earnings per share (“EPS”), both basic and diluted, for 2009 and 2008, were $0.70 and $0.68 per share, respectively. OPERATING - Net cash provided from operating activities was $9,703,198 for the fiscal year ended December 31, 2009, as compared to $9,673,487 of net cash provided by operating activities for the fiscal year ended December 31, 2008, an increase of $29,711. Our primary cash flows from net income were realized through the sale of automotive parts. Net income after deducting non-cash items provided cash inflows at approximately $17.2 million for the fiscal year ended December 31, 2009 as compared to $16.6 million for the fiscal year ended December 31, 2008, an increase of $0.6 million. Cash flows from accounts receivable and notes receivable decreased by approximately $13.7 million for the fiscal year ended December 31, 2009 as compared with the fiscal year ended December 31, 2008, as a result of the high level of accounts receivable and notes receivable at December 31, 2009. The increase in accounts receivable was primarily due to the increase of the sales for the OEM market. The ending balance of accounts receivable as of December 31, 2009 was consistent with our normal practice. Additionally, most of accounts receivable were collected through bank acceptance during the fiscal year ended December 31, 2009, causing the increase in notes receivable. The Company established more distribution warehouses close to major OEM customers and maintained more stock in those warehouses to ensure timely deliveries at the request of major OEM customers. As a result, the Company maintained a high inventory level as of the end of fiscal year ended December 31, 2008. Because we normally require certain overseas and after-market customers to pay in advance before delivering goods, and due to the decreased sales in the overseas and after-market segments, cash flow generated from deposits received from customers decreased approximately $6.6 million for the fiscal year ended December 31, 2009 as compared with the fiscal year ended December 31, 2008. These declines in cash flow from operations were largely offset by cash flows in 2009 associated with inventory and other current assets reductions, and changes in liabilities. At December 31, 2009, the Company had cash and cash equivalents of $10,255,259, as compared to cash and cash equivalents of $7,795,987 at December 31, 2008. The Company had working capital of $75,909,745 at December 31, 2009, as compared to working capital of $61,586,125 at December 31, 2008, reflecting current ratios of 5.05:1 and 5.36:1, respectively. INVESTING - During the fiscal year ended December 31, 2009, the Company expended net cash of $7,252,359 in investing activities, mainly including the funds for acquisition of new equipment to support the growth of business. For the fiscal year ended December 31, 2008, the Company utilized $3,136,574 in investing activities. FINANCING –Net cash used by financing activities was $3,482,360 for the fiscal year ended December 31, 2008, while cash flow from financing activities were positive, in an immaterial amount, for the fiscal year ended December 31, 2009, due to the fact that during fiscal year ended December 31, 2008, the Company repaid all its outstanding debt. The Company’s management has taken a number of steps to restructure its customer base and phase out accounts that failed to make prompt payment. The Company also placed more emphasis on accounts receivable collection. In addition, the Company maintains good relationships with local banks. We believe that our current cash and cash equivalents, including the proceeds of our February 2010 stock offering, and anticipated cash flow generated from operations and our bank lines of credit, will be sufficient to finance our working capital requirements for the foreseeable future. At December 31, 2009 and December 31, 2008, we did not have any material commitments for capital expenditures or have any transactions, obligations or relationships that could be considered off-balance sheet arrangements. Assets and liabilities of our operating subsidiaries are translated into U.S. dollars at the exchange rate at the balance sheet date, their equity accounts are translated at historical exchange rate and their income and expenses items are translated using the average rate for the period. Any resulting exchange differences are recorded in accumulated other comprehensive income or loss. The Company is adopting such steps as the diversification of currencies used in export sales, and the negotiation of export contracts with fixed exchange rates to reduce the risk of foreign exchange changes. As the Company is currently free of indebtedness for borrowed money, we are not presently exposed to interest rate risk. However, to the extent that the Company borrows money in the future, an increase in market interest rate would cause a commensurate increase in the interest expense related to such borrowings. Prepayments, including $0 and $187,813 from related parties at December 31, 2009 and December 31, 2008, respectively. Other current assets, including $0 and $1,906,070 from related parties at December 31, 2009 and December 31, 2008, respectively. Accounts Payable, including $1,985,291 and $0 due to related parties at December 31, 2009 and December 31, 2008, respectively. Other Current Liabilities, including $200,762 and $0 from related parties at December 31, 2009 and December 31, 2008, respectively. SORL Auto Parts, Inc. (“the Company”) is principally engaged in the manufacture and distribution of automotive air brake systems, air controlling systems and other related components for different types of commercial vehicles, such as trucks, and buses, through its 90% ownership of Ruili Group Ruian Auto Parts Company Limited (“Ruian”) in the People’s Republic of China (“PRC” or “China”). The Company distributes products both in China and internationally under SORL trademarks. The Company’s product range includes 40 categories of brake systems with over 1000 different specifications. (i) Credit risks - The Company has policies in place to ensure that sales of products are made to customers with an appropriate credit history. The Company performs ongoing credit evaluations with respect to the financial condition of its creditors, but does not require collateral. In order to determine the value of the Company’s accounts receivable, the Company records a provision for doubtful accounts to cover probable credit losses. Management reviews and adjusts this allowance periodically based on historical experience and its evaluation of the collection of outstanding accounts receivable. The Company has two customers that each respectively account for more than 5.5% of its total revenues for the period. The Company also has a concentration of credit risk due to geographic sales as a majority of its products are marketed and sold in the PRC. (iii) Interest rate risk - The interest rate and terms of repayments of short-term and long-term bank borrowings are approximately 5.4% per annum. The Company’s income and cash flows are substantially independent of changes in market interest rates. The Company has no significant interest-bearing assets. The Company’s policy is to maintain all of its borrowings in fixed rate instruments. Inventories are stated at the lower of cost or net realizable value, with cost computed on a weighted-average basis. Cost includes all costs of purchase, cost of conversion and other costs incurred in bringing the inventories to their present location and condition. Net realizable value is the estimated selling price in the ordinary course of business less the estimated costs of completion and the estimated costs necessary to make the sale. The Company has made salability evaluation and did not find material impairment as December 31, 2009.